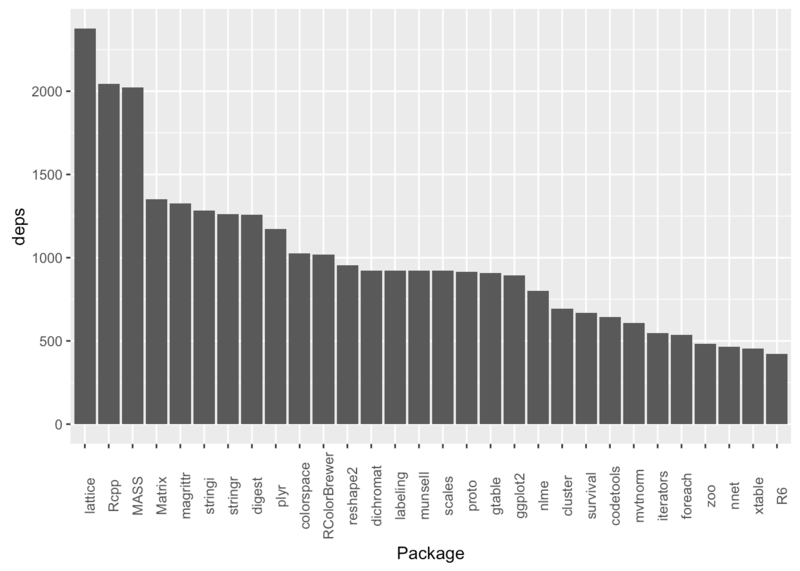 CRAN at the moment (2015-12-12 12:25:37) has 7610 R packages. So there are 3 packages required by 2000 or more other packages. digest 1259 Dirk Eddelbuettel with contributions by Antoine Lucas, Jarek Tuszynski, Henrik Bengtsson, Simon Urbanek, Mario Frasca, Bryan Lewis, Murray Stokely, Hannes Muehleisen, Duncan Murdoch, Jim Hester and Wush Wu. To leave a comment for the author, please follow the link and comment on their blog: R – Software tips, tricks, and hacks.